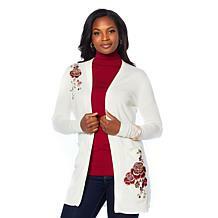 Show a little skin ... in the most tasteful way. Sheer mesh shoulders with floral embroidery add a little va va voom to your day-to-night looks. 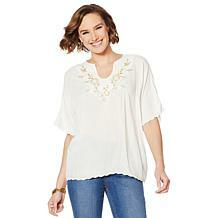 Nothing says weekend or vacation like a comfortable cotton top. 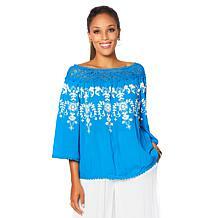 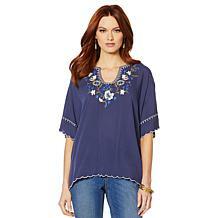 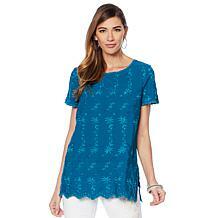 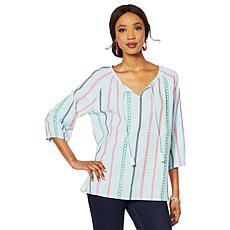 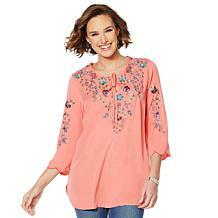 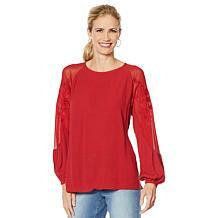 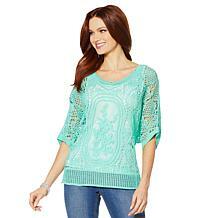 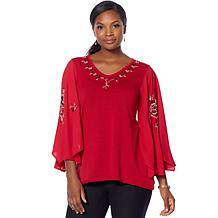 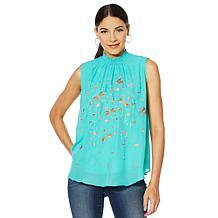 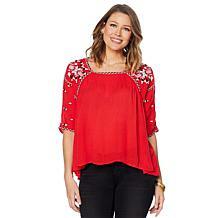 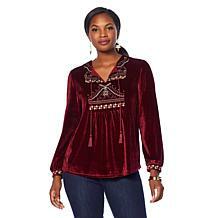 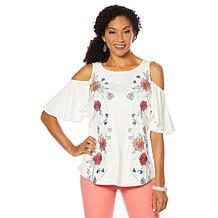 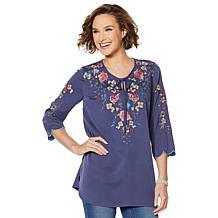 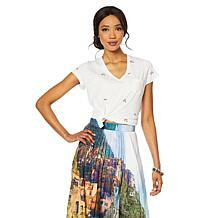 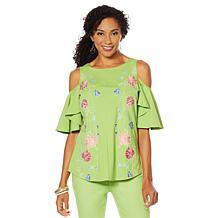 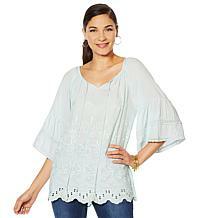 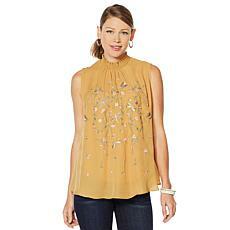 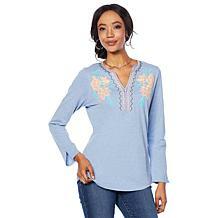 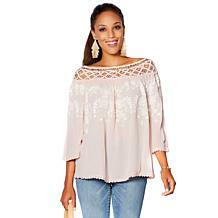 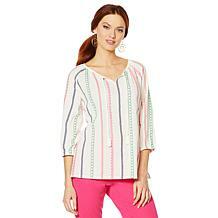 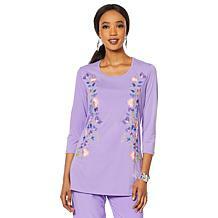 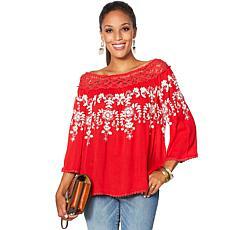 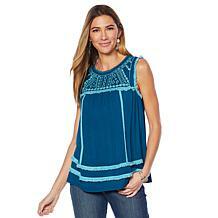 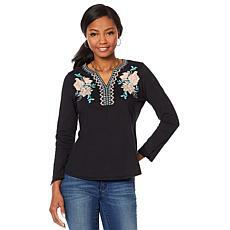 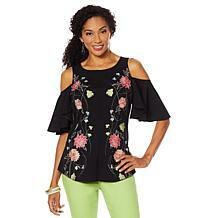 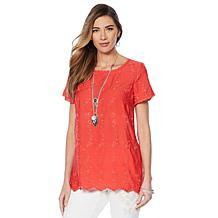 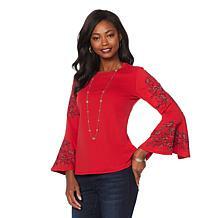 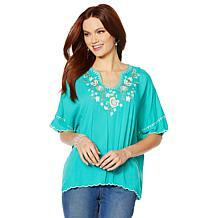 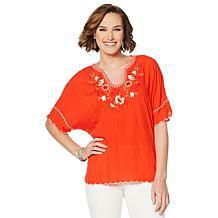 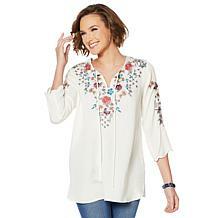 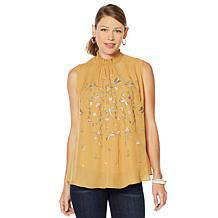 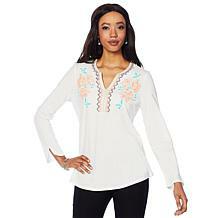 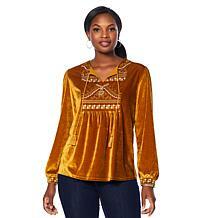 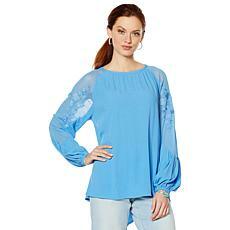 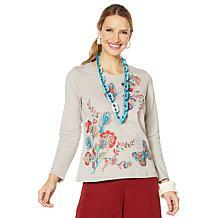 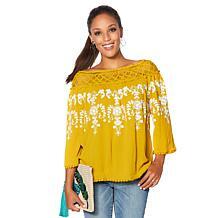 This pintuck blouse stands out with colorful embroidery and hand-beaded tassels along the V neckline. 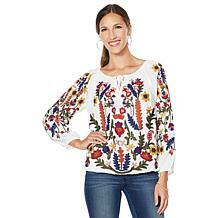 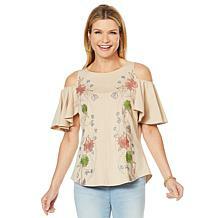 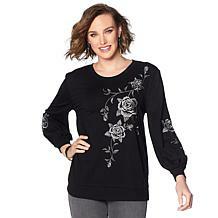 The neckline of this top frames the face in a flattering way while a unique puff printed embroidery technique in a floral design gives a gorgeous handmade look. 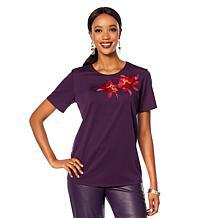 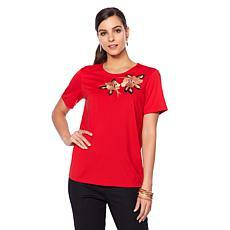 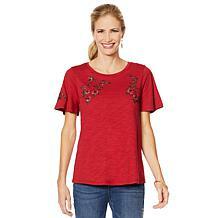 Enjoy the softness and ease of your favorite t-shirt combined with an eye-catching design detail. 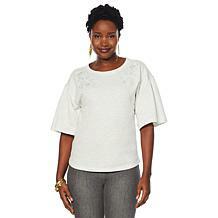 Effortless works best. 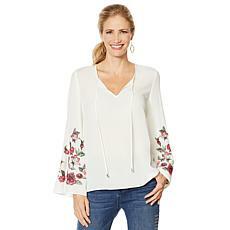 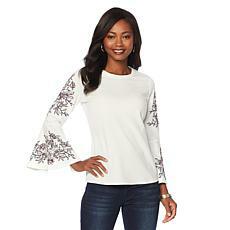 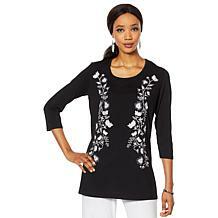 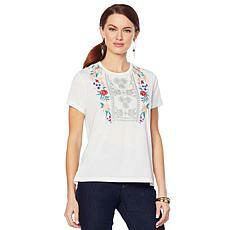 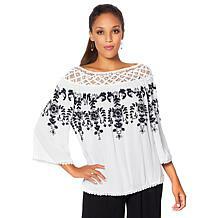 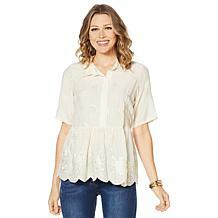 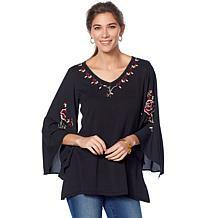 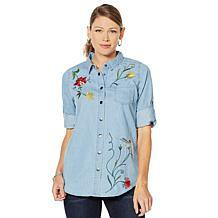 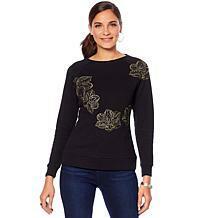 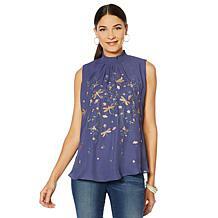 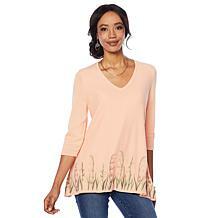 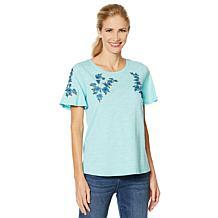 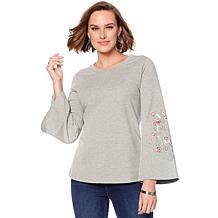 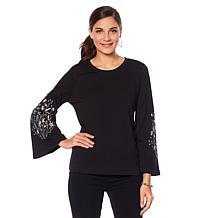 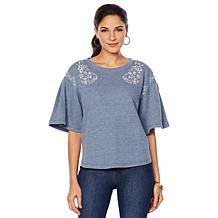 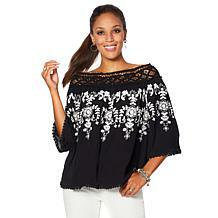 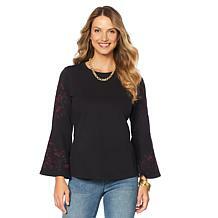 This go-to embroidered top makes working through the week and enjoying the weekend a stylish event. 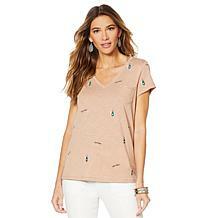 Leave boring tees where they belong... in the back of your closet. 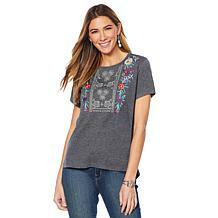 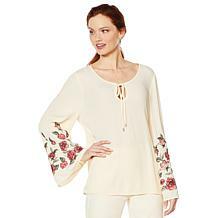 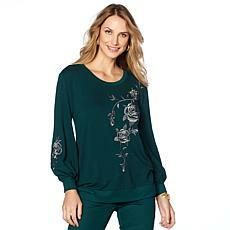 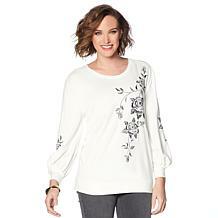 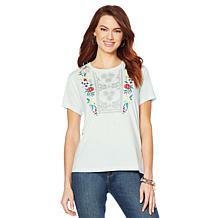 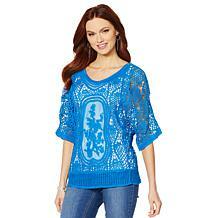 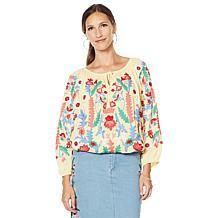 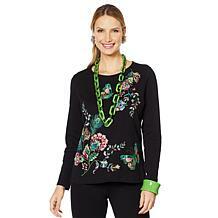 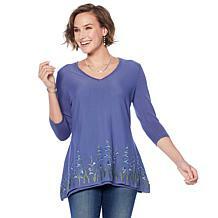 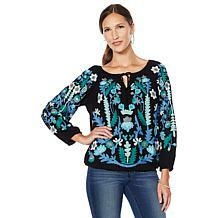 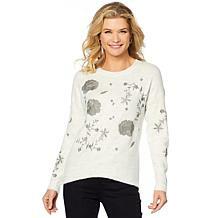 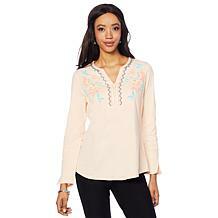 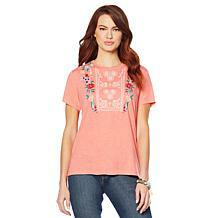 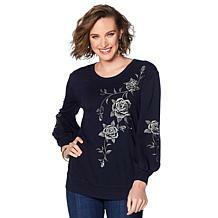 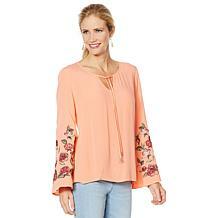 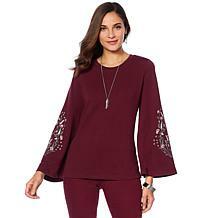 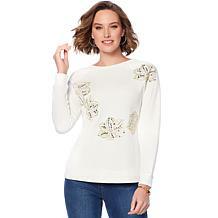 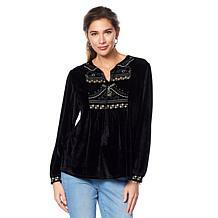 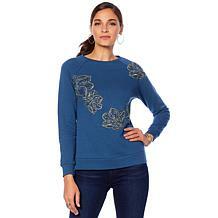 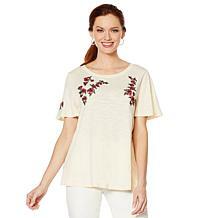 Uo your style factor with this soft, double knit top with colorful embroidery. 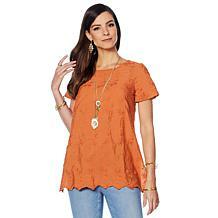 It pairs beautifully with pants, skirts, shorts and jeans. 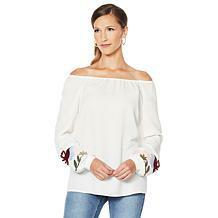 Give boring tees the 'cold' shoulder. 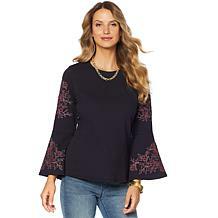 This embroidered top with cutout shoulders and a ruffled sleeves adds a touch of elegance to your day-to-night looks. 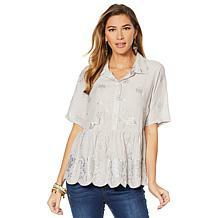 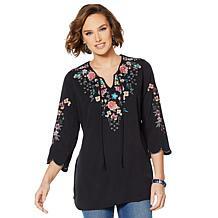 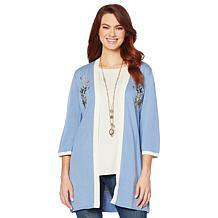 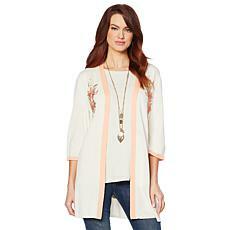 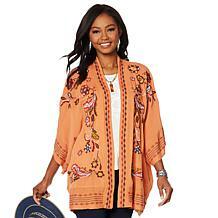 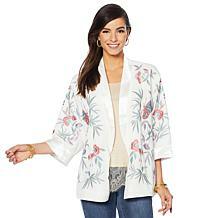 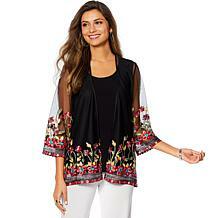 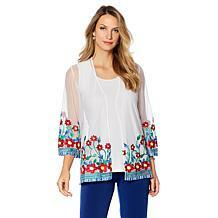 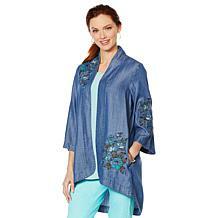 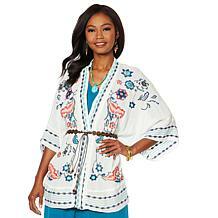 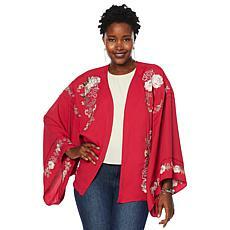 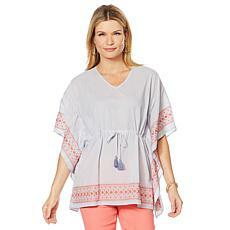 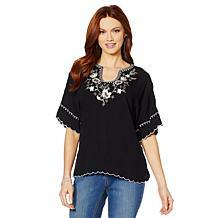 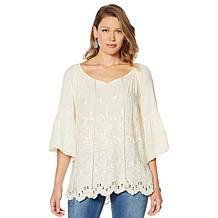 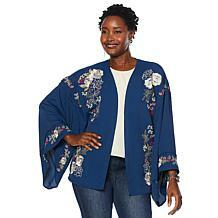 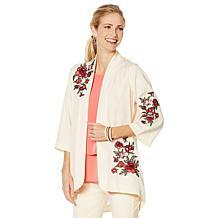 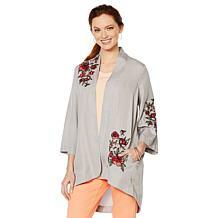 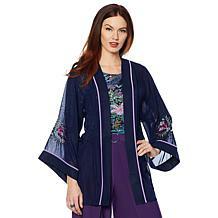 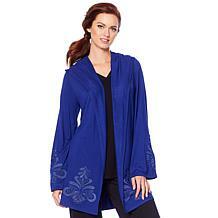 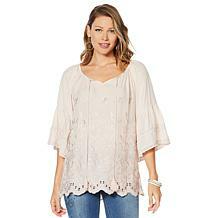 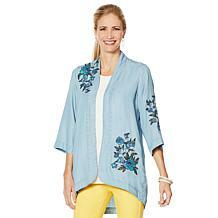 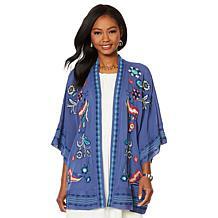 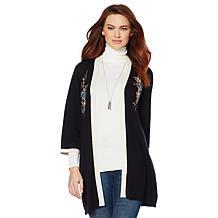 DG2 by Diane Gilman Embroidered Kimono Top An eclectic top, an exotic cover-up. 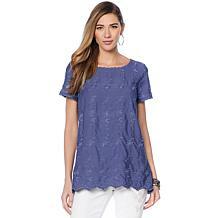 Cinch the drawstring waist for a flattering silhouette. 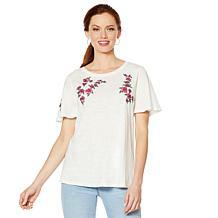 Crafted from 100% cotton for comfort. 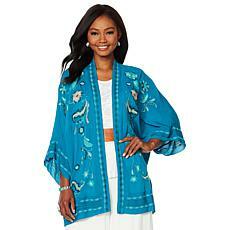 Bohemian glam is effortless. This top renders the trend but with all new colors and chicness. 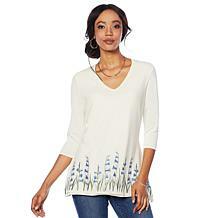 Bloom where you are planted. 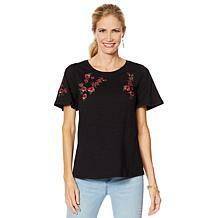 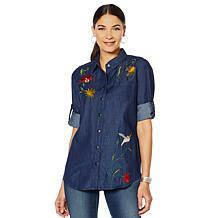 This floral-embroidered tee updates your everyday look with perennial style. 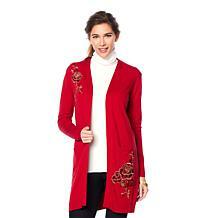 What's your pleasure? 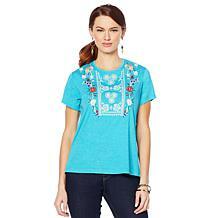 Adorable icons grace this soft tee, letting you showcase your personality via little pops of color and whimsy. 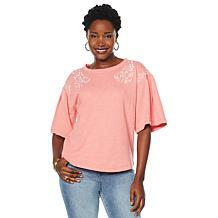 Easy chic. 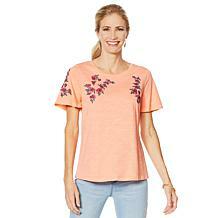 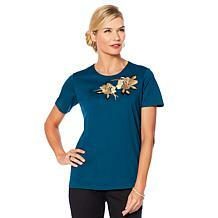 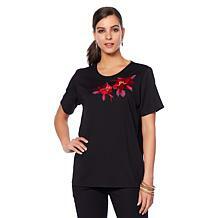 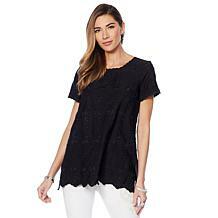 This embroidered tee keeps you moving in a stylish direction and all year too. 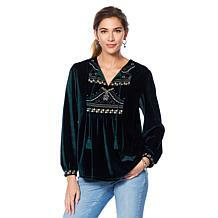 Rock-chic. This embroidered denim shirt moves effortlessly with you during the week, and somehow finds itself perfectly suited for the weekend too. 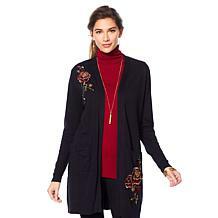 When the seasons shifts, it's time to build a new wardrobe. 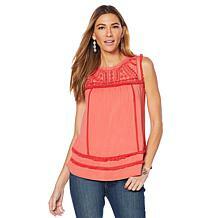 This stylish tank will suit your style needs. 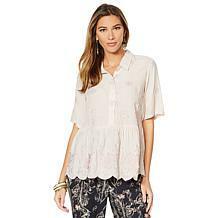 An effortless design with all the trimmings for a glam entrance, you can pair it with shorts and more. Rock a look that gets you noticed for your style and not your intelligence (for once). 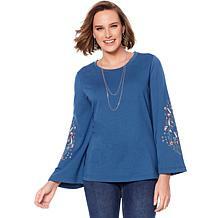 With a delicate embroidery and smocked, mock neck, this sleeveless design adds instant attitude to your jeans and skirts.